Sunday, February 10, 2019 is forever etched in my memory as a day of infamy for Chelsea FC. As a fan, it is the most painful ninety minutes I have ever endured outside of the 2009 Champions League semifinal defeat to FC Barcelona, an occasion on which diabolical refereeing from Norwegian official Tom Henning Ovrebo was responsible for the club’s demise. In pain stakes, John Terry’s slip in the penalty shootout loss to Manchester United in Moscow a year earlier, is a distant third. My reservations about Chelsea’s ability to withstand the football whirlwind that is Manchester City at Etihad Stadium had taken a knock in defeats to Spurs, Arsenal and Bournemouth. Those reservations reached a crescendo as soon as the day’s line up came up on screen during the Tottenham v Leicester City humdinger. Coach Maurizio Sarri evidently refused to respect superior opposition by sticking to his favoured 4-3-3 formation. Fielding Ngolo Kante, the world’s best ball hunting, ball winning holding midfielder in such an advanced position and leaving Jorginho – who is yet to adjust to the faster pace in England, was a recipe for disaster. I echoed my reservations to those seated next to me. “Sarri has refused to change anything. He has thrown us the fans and the team into a blast furnace,” I raged. Unless Sarri learns to adjust his line up and formation to suit different opposition, team owner Roman Abramovich will hound him out of Stamford Bridge. Any self-respecting coach cannot approach Manchester City with a replica of the personnel and formation used to bludgeon Huddersfield Town. Sarri’s Plan A worked a treat in the EPL’s first three months but it is now floundering badly and he is behaving like a rabbit caught in bright lights. The 59-year-old Italian is on record as requesting for time to fine tune his Plan A, before he can think about Plan B. This is wrong. Top coaches like Pep Guardiola possess at least three plans for each game. Hasn’t Sarri seen the Catalan occasionally surprise the opposition with a 3-5-2, or even 3-4-3? Hasn’t Sarri witnessed one of the league’s top central defenders, Aymeric Laporte, deployed as a left back? Hasn’t Sarri viewed John Stones operating to good effect as a holding midfielder? Hasn’t Sarri seen Fernandinho effectively play as a central defender, or even sweeper? Deploying a 4-3-3 at the Etihad yet it has been punctured by average sides like Bournemouth smacked of football suicide. Chelsea’s only chance of upsetting the applecart in the Carabao Cup final against Manchester City lies in finding something new to surprise Guardiola. Sarri-ball remains pleasing to the eye but it must be reinvented for tougher tasks that lie ahead. For example, Chelsea could have gained a lot more mileage by switching to a 4-2-3-1, or 4-3-2-1. Moving David Luiz into the holding role in front of Andreas Christiansen and Antonio Rudiger, with Jorginho and Kante playing besides him could have afforded the West Londoners much needed protection for the back four. Fielding Pedro as part of a front three was a luxury the Stamford Bridge club couldn’t afford. Drafting in Mateo Kovacic in a 4-4-2 could have plugged holes in midfield. And didn’t Ross Barkley first make his reputation as an explosive attacking midfielder? He can continue to improve his defensive attributes but isn’t Sarri converting a potential Ronaldinho into a potential Andrea Pirlo? Maurizio Sarri is correct to question his players’ power of self-motivation. His Chelsea, especially the defense, have been switching off at the start of games. Losses to Tottenham, Arsenal and Man City have all been made easy by alarming drops in concentration that ended up with Chelsea conceding in the opening quarter of an hour. This problem could be assuaged by better leadership. It is about time Cesar Azpilicueta earns his stripes as skipper by communicating better, more often and with firmer authority. Trigger happy Chelsea fans are understandably calling for Abramovich to call time on Sarri’s EPL tenure. They are wrong. Though they’ve witnessed their worst sequence of results, the former Napoli coach deserves time. 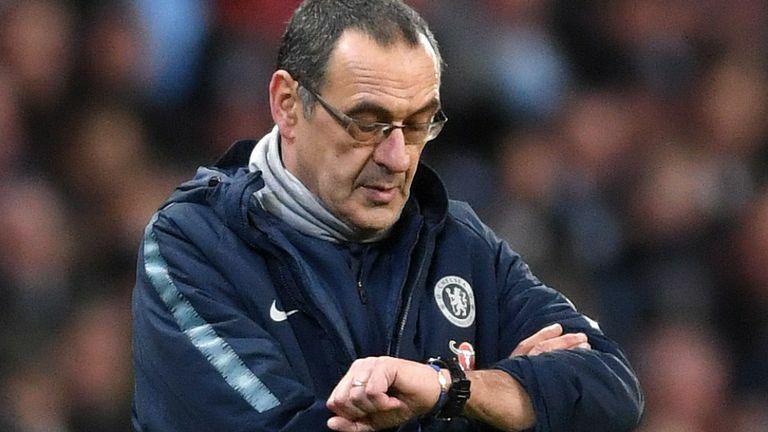 The powers that be at Stamford Bridge – whether its chairman Bruce Buck or Ms Fix It Marina – ought to invite Sarri for a crisis meeting and lay down the LAW. That LAW entails getting the club back into the Champions League via the EPL or winning the Europa League, plus avenging City’s loss in the Carabao Cup final. Anything short of that should lead to the Italian’s ouster.